Progress in software engineering over the past two decades has been made through the development of increasingly powerful and natural high-level abstractions with which to model and develop complex systems. Procedural abstraction, abstract data types, and, most recently, objects and components are all examples of such abstractions. Agents represent a similar advance in abstraction: they may be used by software developers to more naturally understand, model, and develop an important class of complex distributed systems. If agents are to realize their potential as a software engineering paradigm, then it is necessary to develop software engineering techniques that are specifically tailored to them. Existing software development techniques (for example, object-oriented analysis and design) are unsuitable for this task. There is a fundamental mismatch between the concepts used by object-oriented developers and the agent-oriented view. For these reasons, Here is introduced a methodology called Gaia, which has been specifically tailored to the analysis and design of agent-based systems. Abstract entities are those used during analysis to conceptualize the system, but which do not necessarily have any direct realization within the system. Concrete entities, in contrast, are used within the design process, and will typically have direct counterparts in the run-time system. The most abstract entity in concept hierarchy is the system. Although the term “system” is used in its standard sense, it also has a related meaning when talking about an agent-based system, to mean “society” or “organization”. The idea of a system as a society is useful when thinking about the next level in the concept hierarchy: roles. A role is defined by four attributes: responsibilities, permissions, activities, and protocols. Responsibilities determine functionality and, as such, are perhaps the key attribute associated with a role. An example responsibility associated with the role of company president might be calling the shareholders meeting every year. Responsibilities are divided into two types: liveness properties and safety properties. Liveness properties intuitively state that “something good happens”. They describe those states of affairs that an agent must bring about, given certain environmental conditions. In contrast, safety properties are invariants. Intuitively, a safety property states that “nothing bad happens” (i.e., that an acceptable state of affairs is maintained across all states of execution). An example might be “ensure the reactor temperature always remains in the range 0-100”. In order to realize responsibilities, a role has a set of permissions. Permissions are the “rights” associated with a role. The permissions of a role thus identify the resources that are available to that role in order to realize its responsibilities. In the kinds of system that have been typically modeled, permissions tend to be information resources. For example, a role might have associated with it the ability to read a particular item of information, or to modify another piece of information. A role can also have the ability to generate information. The *activities* of a role are computations associated with the role that may be carried out by the agent without interacting with other agents. Finally, a role is also identified with a number of protocols, which define the way that it can interact with other roles. For example, a “seller” role might have the protocols “Dutch auction” and “English auction” associated with it; the Contract Net Protocol is associated with the roles “manager” and “contractor”. Thus, the organization model in Gaia is comprised of two further models: the roles model (section 3.1) and the interaction model (section 3.2). The permissions/rights associated with the role. A role will have associated with it certain permissions, relating to the type and the amount of resources that can be exploited when carrying out the role. In our case, these aspects are captured in an attribute known as the role’s permissions. The responsibilities of the role. A role is created in order to do something. That is, a role has certain functionality. This functionality is represented by an attribute known as the role’s responsibilities. Permissions. The permissions associated with a role have two aspects: _ they identify the resources that can legitimately be used to carry out the role — intuitively, they say what can be spent while carrying out the role; _ they state the resource limits within which the role executor must operate – intuitively, they say what can’t be spent while carrying out the role. In general, permissions can relate to any kind of resource. In a human organization, for example, a role might be given a monetary budget, a certain amount of person effort, and so on. However, in Gaia resources are thought as relating only to the information or knowledge the agent has. Responsibilities. The functionality of a role is defined by its responsibilities. These responsibilities can be divided into two categories: liveness and safety responsibilities. Liveness responsibilities are those that, intuitively, state that “something good happens”. Liveness responsibilities are so called because they tend to say that “something will be done”, and hence that the agent carrying out the role is still alive. Liveness responsibilities tend to follow certain patterns. For example, the guaranteed response type of achievement goal has the form “a request is always followed by a response”. The infinite repetition achievement goal has the form “x will happen infinitely often”. processing: brief textual description of any processing the protocol initiator performs during the course of the interaction. Output: A prototypical roles model — a list of the key roles that occur in the system, each with an informal, unelaborated description. 2. For each role, identify and document the associated protocols. Protocols are the patterns of interaction that occur in the system between the various roles. For example, a protocol may correspond to an agent in the role of BUYER submitting a bid to another agent in the role of SELLER. Output: An interaction model, which captures the recurring patterns of inter-role interaction. 3. Using the protocol model as a basis, elaborate the roles model. Output: A fully elaborated roles model, which documents the key roles occurring in the system, their permissions and responsibilities, together with the protocols and activities in which they participate. The aim of a “classical” design process is to transform the abstract models derived during the analysis stage into models at a sufficiently low level of abstraction that they can be easily implemented. This is not the case with agent-oriented design, however. Rather, the aim in Gaia is to transform the analysis models into a sufficiently low level of abstraction that traditional design techniques (including object-oriented techniques) may be applied in order to implement agents. To put it another way, Gaia is concerned with how a society of agents cooperate to realize the system-level goals, and what is required of each individual agent in order to do this. Actually how an agent realizes its services is beyond the scope of Gaia, and will depend on the particular application domain. The Gaia design process involves generating three models (see Figure 1). The agent model identifies the agent types that will make up the system, and the agent instances that will be instantiated from these types. The services model identifies the main services that are required to realize the agent’s role. 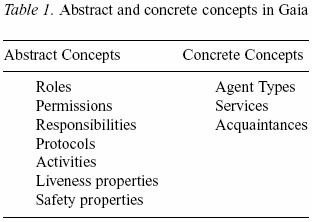 Finally, the acquaintance model documents the lines of communication between the different agents. As its name suggests, the aim of the Gaia services model is to identify the services associated with each agent role, and to specify the main properties of these services. By a service, is meant a function of the agent. In OO terms, a service would correspond to a method; however, we do not mean that services are available for other agents in the same way that an object’s methods are available for another object to invoke. Rather, a service is simply a single, coherent block of activity in which an agent will engage. It should be clear there every activity identified at the analysis stage will correspond to a service, though not every service will correspond to an activity. For each service that may be performed by an agent, it is necessary to document its properties. Specifically, we must identify the inputs, outputs, pre-conditions, and post-conditions of each service. Inputs and outputs to services will be derived in an obvious way from the protocols model. Pre- and post-conditions represent constraints on services. These are derived from the safety properties of a role. Note that by definition, each role will be associated with at least one service. The services that an agent will perform are derived from the list of protocols, activities, responsibilities and the liveness properties of a role. The developer is free to realize the services in any implementation framework deemed appropriate. For example, it may be decided to implement services directly as methods in an object-oriented language. Alternatively, a service may be decomposed into a number of methods. The final Gaia design model is probably the simplest: the acquaintance mode. Acquaintance models simply define the communication links that exist between agent types. They do not define what messages are sent or when messages are sent – they simply indicate that communication pathways exist. In particular, the purpose of an acquaintance model is to identify any potential communication bottlenecks, which may cause problems at runtime. It is good practice to ensure that systems are loosely coupled, and the acquaintance model can help in doing this. On the basis of the acquaintance model, it may be found necessary to revisit the analysis stage and rework the system design to remove such problems. An agent acquaintance model is simply a graph, with nodes in the graph corresponding to agent types and arcs in the graph corresponding to communication pathways. Agent acquaintance models are directed graphs, and so an arc a->b indicates that a will send messages to b, but not necessarily that b will send messages to a. An acquaintance model may be derived in a straightforward way from the roles, protocols, and agent models. document the instances of each agent type using instance annotations. 2. Develop a services model, by examining activities, protocols, and safety and liveness properties of roles. 3. 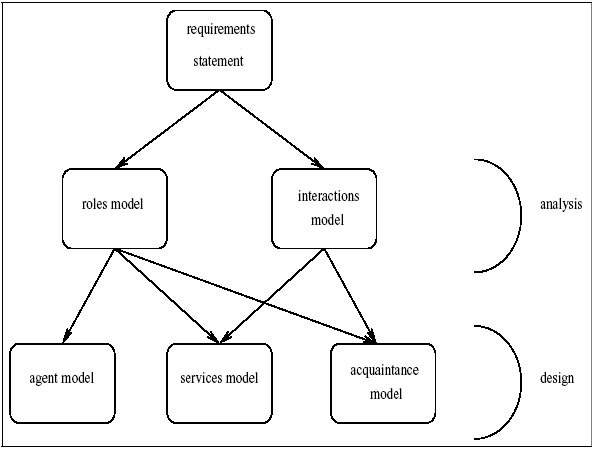 Develop an acquaintance model from the interaction model and agent model. 5. Conclusions and Further Work. In this article, we have described Gaia, a methodology for the analysis and design of agent-based systems. 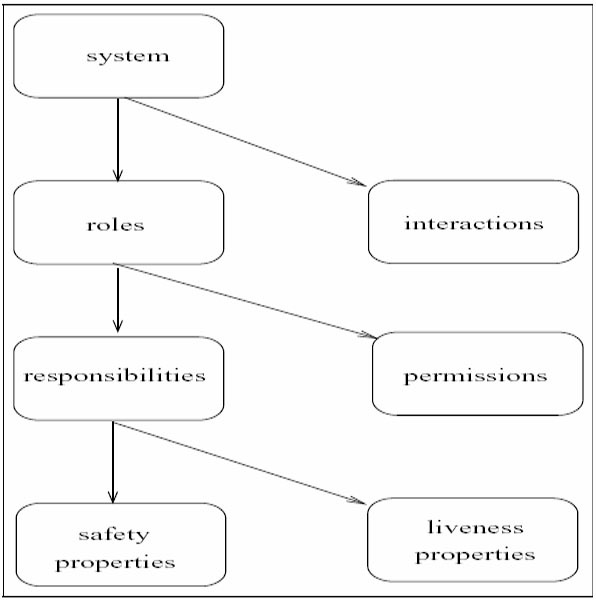 The key concepts in Gaia are roles, which have associated with them responsibilities, permissions, activities, and protocols. Roles can interact with one another in certain institutionalized ways, which are defined in the protocols of the respective roles. There are several issues remaining for future work. Self-Interested Agents. Gaia does not explicitly attempt to deal with systems in which agents may not share common goals. This class of systems represents arguably the most important application area for multiagent systems, and it is therefore essential that a methodology should be able to deal with it. Dynamic and open systems. Open systems — in which system components may join and leave at run-time, and which may be composed of entities that a designer had no knowledge of at design-time — have long been recognized as a difficult class of system to engineer. Organization structures. Another aspect of agent-based analysis and design that requires more work is the notion of an organizational structure. At the moment, such structures are only implicitly defined within Gaia — within the role and interaction models. However, direct, explicit representations of such structures will be of value for many applications. For example, if agents are used to model large organizations, then these organizations will have an explicitly defined structure. Representing such structures may be the only way of adequately capturing and understanding the organization’s communication and control structures. More generally, the development of organization design patterns might be useful for reusing successful multi-agent system structures. Cooperation Protocols. The representation of inter-agent cooperation protocols within Gaia is currently somewhat impoverished. In future work, we will need to provide a much richer protocol specification framework. International Standards. Gaia was not designed with any particular standard for agent communication in mind (such as the FIPA agent communication language). However, in the event of wide scale industrial take-up of such standards, it may prove useful to adapt our methodology to be compatible with such standards. Formal Semantics. Finally, we believe that a successful methodology is one that is not only of pragmatic value, but one that also has a well-defined, unambiguous formal semantics. While the typical developer need never even be aware of the existence of such semantics, it is nevertheless essential to have a precise understanding of what the concepts and terms in a methodology mean. (c) Michael Wooldridge, Nicholas R. Jennings, David Kinny "The Gaia Methodology for Agent-Oriented Analysis and Design"
Topic revision r1.2 - 01 Jun 2004 - 10:17 GMT - UkHarder?